Creating a product with a compelling mix of features is not easy. I always find the Kano Model helpful when trying to come up with that right mix. Not all features add to customer satisfaction in the same way and customers do not voice all of their expectations, because not all of them are conscious. 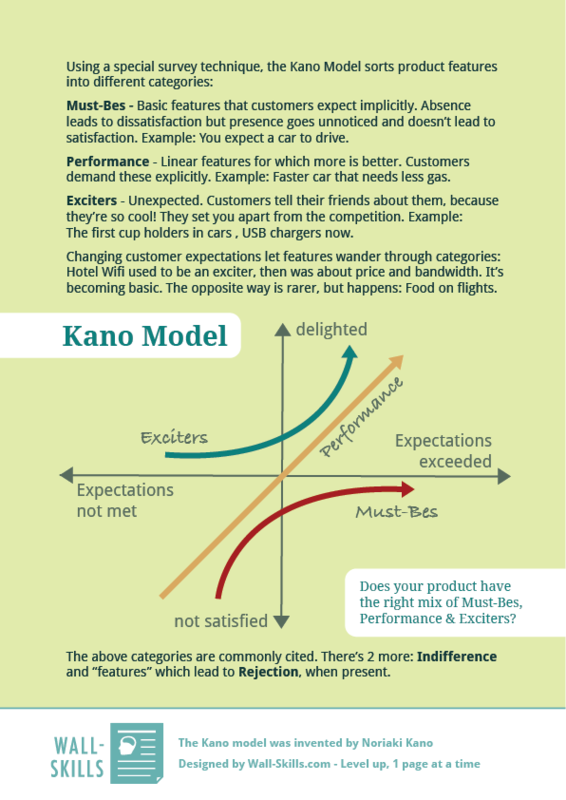 Check out the different feature categories of the Kano model in this week’s 1-pager. Wondering how you find out which feature is in which category? You create a survey that asks 2 questions for each feature, 1 question postive “How do you feel if X is there” and 1 negative “How do you feel if there is no X”. From the combination of responses to positive and negative phrasing you can deduce which category X falls into. Learn more at Folding Burrito’s excellent explanation. Does your product have the right mix of Must-Bes, Performance & Exciters? Must-Bes – Basic features that customers expect implicitly. Absence leads to dissatisfaction but presence goes unnoticed and doesn’t lead to satisfaction. Example: You expect a car to drive. Performance – Linear features for which more is better. Customers demand these explicitly. Example: Faster car that needs less gas. The first cup holders in cars , USB chargers now. Changing customer expectations let features wander through categories: Hotel Wifi used to be an exciter, then was about price and bandwidth. It’s becoming basic. The opposite way is rarer, but happens: Food on flights. The above categories are commonly cited. There’s 2 more: Indifference and “features” which lead to Rejection, when present.